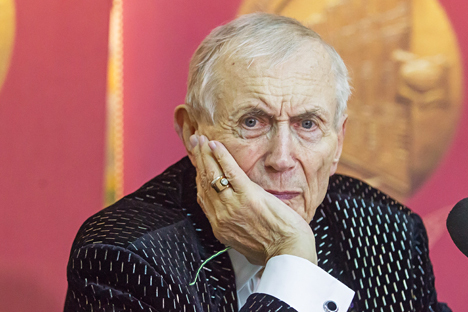 One of Russia’s greatest living poets, Yevgeny Yevtushenko, discussed racism, hatred, and the pressing need to be nonjudgmental at a book reading in Moscow. I spoke in St. Petersburg a few days ago, and a wonderful girl from the Pushkin Museum was in the audience. I asked her whether it had ever occurred to her that there is a sector of our society that would kill Pushkin on the spot simply for the color of his skin. She said that, unfortunately, this had crossed her mind, and began to cry. Then there is what happened in Armenia, where, in spite the long-standing friendship between the Russian and Armenian people, our soldier committed a terrible act [a Russian soldier shot an entire family in the city of Gyumri in January]. Of course, he can’t have been in his right mind; he had lost his humanity and was striking out at all mankind. But what shook me most of all was an awful discussion I overheard about this event when I was traveling to a meeting. This was an episode that was already full of hatred, but the people I heard were doing nothing but adding to their own accumulated, internal hatred – blind and directionless. Such people are so full of frustration at life that the only answer they can ever see is combating hatred with hatred. We need to defuse violence, anger and hatred wherever we find them. The Internet is a breeding ground for such emotions; you just have to see the immensely offensive online arguments to realize this. I remember how shocked I was when Nelson Mandela died. He was one of the best and most righteous people on the planet; he did not bear a grudge against all white people, despite having been kept in solitary confinement for 27 years. When he was freed and the situation was about to blow up, he realized how much responsibility for his own people, for their future, for mankind, lay on his shoulders. He extended a hand to his foe to help escape the cycle of seemingly unrelenting bloodshed. Had he not done so, racism could have engulfed the whole of humanity. I remember an image from my childhood. In 1944 I saw the Germans leaving Stalingrad. There were about 30,000 of them. Suddenly, some Russian women who were standing nearby broke through the cordon of soldiers and rushed towards the German convoys. Just when it seemed like something terrible was about to happen, they suddenly started pulling out their rations of bread, seeing those wounded teenage soldiers with puttees bound around their legs. I will never forget that: it was a great lesson about what lies in the soul of the Russian people. With respect to the general philosophical embodiment of all this, we must turn to Fyodor Dostoyevsky. When discussing Pushkin, his favorite poet, he said his best quality was his “responsiveness.” This is an amazing Russian word [otzyvchivost] that is, unfortunately, difficult to translate with literal accuracy. I think we writers keep searching for some sort of new Russian idea, when a great Russian idea already exists: universal responsiveness [which also contains the meanings sympathy, kindheartedness and sensitivity]. I remember Yevgenia Ginzburg’s documentary work “Journey Into the Whirlwind” about female concentration camps. It is one of the best, most powerful books on humanity. That book influenced me more than “One Day in the Life of Ivan Denisovich” and many other works on the same topic, because the most horrifying thing was Stalin’s victimization of women. And yet she never lapses into hatred in the book. I am often reproached for the fact that I teach in America. I am even accused of selling my soul to the CIA. But I’m teaching the grandchildren of those who embraced our grandfathers and fathers on the Elba. A student of mine once wrote the following about my movie “Kindergarten”: “I am so grateful to you, Mr. Yevtushenko, for this film. Even though Russia fought against America on Hitler’s side, it still has some good people. You showed us that.” I was in shock for a little while, but then I understood; later I looked into her eyes and spoke to her gently. I told her everything. She became one of the best students in my class. You see, you shouldn’t rush to call people lost, or out of touch, or aliens, or whatever. Sometimes they simply don’t know some things. In a sense, we should all be nonjudgmental teachers; then we won’t have anymore Stalins or Hitlers. An abridged version of the interview first published in Russian by Rossiyskaya Gazeta.